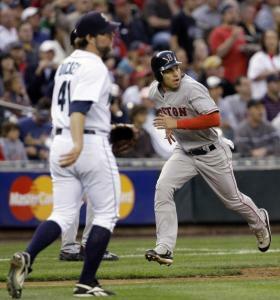 Matsuzaka almost wrapped another string of zeroes around the necks of the Mariners, who failed to score against Lester and Jonathan Papelbon Monday night, and were almost as harmless against Matsuzaka in the Red Sox' 4-2 win before 38,425 in Safeco Field. Without the fanfare that accompanied his every move last summer, Matsuzaka has quietly become one of the American League's stingiest pitchers. He hangs a zero, power walks off the mound like he's trying to catch the last commuter train to Kyoto, then comes back out and does it again. Last night, he did so with an efficiency that spared manager Terry Francona from answering questions about what's wrong with a guy who is 11-1 with a 2.63 ERA, which would rank him third in the American League in ERA if he had enough innings to qualify. "He's given up so few hits," Francona said of the Japanese righthander, who allowed just two singles in the first seven innings before the Mariners touched him for three hits and two runs in the eighth. "He's made it harder sometimes because of his command, but if he keeps winning, I'll gladly answer the questions." Matsuzaka's streak of 24 1/3 scoreless innings ended in the eighth. Bryan LaHair, the kid from Worcester, opened the inning by lining a single to right, his first major league hit. Ichiro Suzuki, who had rolled out on Matsuzaka's first pitch of the game, then walked twice, doubled to right-center, scoring LaHair. When Jose Lopez followed with an RBI single up the middle, Francona summoned Hideki Okajima, who last pitched nine days ago, to face Raul Ibanez. Okajima gave the Sox a sample of Oki, vintage '07, inducing Ibanez to hit into a force play and retiring Jose Vidro on a liner to left. "You want to get everybody on a roll, as many guys as you can," Francona said of Okajima, who rarely has had success this season when entering with runners on base (12 of 17 inherited runners had scored before last night). While Francona left Okajima in the pen in Anaheim, pitching coach John Farrell said in a recent conversation that Okajima is showing some encouraging signs. "Because he was mindful of the 162-game schedule after we backed him off last season, he was less aggressive and did not have as much reckless abandon in attacking hitters," Farrell said. "Because of that there was a little less sharpness to his pitches." There also was a noticeable loss of confidence and frustration. "We worked on that, and there's a little more mature attitude now. And what we're getting now is more like we were accustomed to getting last year." Matsuzaka had gone two straight starts without being scored upon, and he went into the seventh inning last night having thrown just 83 pitches, after being lifted in his last start against Baltimore after 115 pitches in six innings. He then breezed through the seventh on just eight pitches. He was tested early once, in the fourth, when he walked Ibanez on four pitches and Vidro followed by lining a single to center. Matsuzaka coaxed a double-play ground ball out of Adrian Beltre, and safely returned to the dugout when Jeremy Reed grounded to third. The Mariners are 5-39 when they have scored fewer than four runs and have been shut out six times. Matsuzaka's teammates, meanwhile, got a little taste of what their rivals face when Tim Wakefield is pitching: They faced a knuckleballer, R.A. Dickey, a former failed bonus baby who adopted the knuckler as a way to survive. Wakefield has been generous to Dickey with his help, but all knuckleballers are not created equal (see Zink, Charlie), and the Sox were not baffled against Dickey, who throws his knuckler with considerably more velocity than Wakefield and without the same flutter factor. J.D. Drew, who had been a nonfactor on this trip (1 for 15), hit his 18th home run in the first to give the Sox a 1-0 lead, hit a sacrifice fly when the Sox added three in the fifth, and had a base hit in the seventh. The Sox, who left 13 men on in Monday's 4-0 win and were batting just .118 (4 for 34) with runners in scoring position over the previous five games, left two on in the first and the bases loaded in the second. But Jacoby Ellsbury, trying to shake a 2-for-17 skid, dropped a bunt single to open the fifth and Dustin Pedroia singled down the left-field line, Ellsbury hustling to third. Drew's fly ball to center scored Ellsbury to make it 2-0, Manny Ramírez blooped a single to left, and Mike Lowell followed with an RBI double to make it 3-0. Kevin Youkilis was walked intentionally, but Jed Lowrie followed with another sacrifice fly to score Ramírez, who could stroll home here without worrying about a ticket for jaywalking, which had not been the case when he left Safeco Field the night before.